The Aquarius rescue ship drama has shone the spotlight on Europe's deep divisions over migration. Euronews captured exclusive footage as the events unfolded - catching the attention of so many. Correspondent Anelise Borges was the only broadcast journalist onboard the vessel. "The idea was try and put names and faces to the numbers and try to give this crisis a more human aspect and to try to tell people that we are talking about people," she explained. "This is a very complicated political issue, a very divisive issue. Something that exposed some very profound and unresolved tensions within the EU." As Brussels basks in the summer sun, the heat of the migration debate inside the European Council is stifling. Countries like Italy have come to a two-day EU summit with clear demands. "Today finally Europe deals with this problem that was a burden for years for Italy, which has impoverished the country," said Angelo Ciocca, Italy League MEP. "It is not possible to distribute African poverty in Europe. We must act to stop arrivals. If we talk about distributing those that are fleeing war, then I welcome the alliance with other European countries, as well as the redistribution." 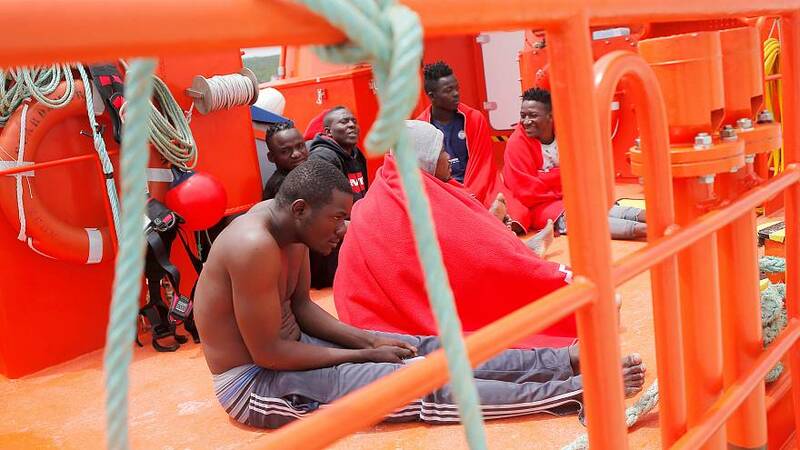 And as more migrants head for Europe, the EU is considering offshore processing - so-called disembarkation platforms. Something that's already being slammed. "These platforms will not in any case be black holes or prisons or Guantanamos," said European Commission spokesperson Margaritis Schinas. "These will be platforms that will be operated in full conformity and respect of international law. I really cannot be more concrete because we are having a summit precisely to allow our leaders tonight to discuss and decide how they imagine these possible options." This as ex-communist easterners - led by Poland and Hungary - refuse to accept a share of new migrant arrivals - to lighten the load on Italy, and Greece. Former French ambassador Pierre Vimont told Euronews: "What we are witnessing at the moment is an attempt by more and more member states to push back and to some extent to refuse to abide by principles of international law. "What is at stake at the end of the day is the Geneva Convention of 1951. It has nothing to do with European legislation, it's above that." No country outside Europe has been willing to host the offshore processing centres - but the EU hopes political backing will stave off demands for tougher action.